Over the years, I’ve done my fair share of travel. And let me tell you, what you pack in your suitcase or carryon can make a world of difference in how well you travel that road. 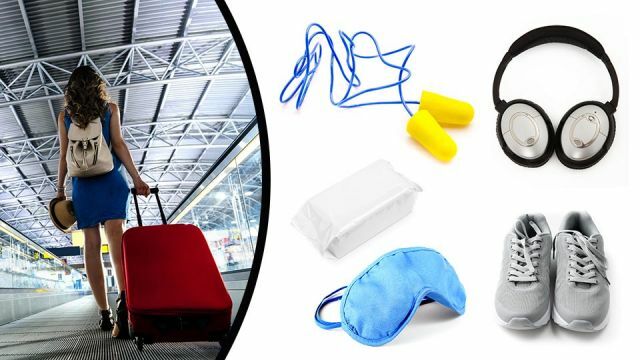 Whether I need to shut out ambient noise on a red eye, plug in a dead cell phone at the Parthenon or cover my bare shoulders in a Buddhist temple, these travel must-haves get the job done. Whether I’m chilly or just “chillin” on a long flight, I like to wrap myself in a comfy scarf — small enough to wrap around my neck, but big enough to wear as a shawl if necessary. Scarfs are also handy to use as a cover-up when entering a religious site, or to cover that unsightly coffee stain on your t-shirt. High-heeled sandals may look great with your manicured tootsies, but when you hit those cobblestone streets, your feet will be crying for comfortable footwear. Walking is, without a doubt, one of the best ways to tour a city or town. That’s why I generally bring two pairs of walking shoes on my travels. One built for comfort and design and another built for more adventurous walking. A versatile walking shoe or sandal should take you painlessly through shopping, a five-hour walking tour and finally to dinner. When cleaning my face on the road (not literally) is next to impossible, makeup remover wipes are a lifesaver. When I’m traveling long-distance by plane, train or automobile, pre-moistened makeup remover wipes are handy and store easily in my purse or carryon. Airplane travel can dry your skin, making your face appear dull and fine lines more noticeable. A nice quality, silky, hydrating face-mist is a must have during my travels. Face mist is an excellent skin refresher and an instant pick-me-up. When flying, or even when sightseeing under the hot sun, I spritz my face with a fine mist spray — right over my makeup — to replenish moisture and prevent caking. Headphones are great to cancel out excess noise on a flight. Noise-canceling headphones won’t give you total silence, but they will muffle out a good chunk of ambient (or background) noise. For me, this is incredibly important when I’m trying to work, or want to catch a few Zzz’s on a long-haul flight. Different countries use different power socket heads. For instance, European countries use a circle-shaped two-pin plug, rather than the rectangular-shaped two-pin plug we’re familiar with in the U.S. and Canada. This is why I always pack a universal power adapter, making it possible to connect my chargers, straighteners or hubby’s shaver into a power socket. As a writer, I tend to use my smartphone a lot during my travels. Then there are emails, social media and just generally touching base with family and friends. My batteries burn out faster than I do! When I need to charge my cellphone in places where a power source may be scarce, my portable charger is always available. Loud talkers, babies crying… most travel environments are not that conducive for sleep. That’s why I always carry a pair of earplugs. They may not block out 100 percent of the noise, but they’re great for reducing ambient noise on planes and trains, or in hotel rooms with air-conditioning units that run way too loud. An eyemask ensures you can sleep anytime, anywhere. I never realized the benefit of wearing a sleeping mask until I was given one on a long flight to Hawaii. The sleeping mask allowed for a more deeper sleep on the plane. It also works great for masking out that annoying bright light often omitted from a hotel clock radio. Sometimes I just want to quickly jot down directions, thoughts or ideas when I travel. Plus, I always keep a pen and notebook to write down my hotel address, in both English and the language of the country I am visiting — just in case. I also like to keep track of my spending, and use the pages to secure receipts for customs. A notebook can also serve as a travel log or to simply reflect. An international debit card allows you to withdraw money from any ATM machine in the world. But, you can also use this debit card like a credit card. Except unlike a credit card, the amount withdrawn is deducted directly from your checking or savings account. While there is a small fee each time you withdraw money, you can still avoid high credit card fees and interest rates. I got mine from my local bank and I always bring it when I travel. Simply ask your bank about international debit cards for travel. When I travel, I always pack a well-stocked first aid kit. Remedies that treat diarrhea symptoms and stomach upsets are invaluable when you need relief fast. Yes, I learned this the hard way. When I needed relief from Montezuma’s revenge, over-the-counter medications were nowhere to be found on a small third-world island. I was offered help from the hotel doctor, but at a cost. And let me tell you, the cost was high — hundreds of U.S. dollars for one room visit. Ouch! My motto is this: pack light but pack smart. Happy trails! Hey Buddy!, I found this information for you: "12 Travel Must-Haves I Can’t Live Without". Here is the website link: https://www.thealternativedaily.com/12-travel-must-haves-i-cant-live-without/. Thank you.